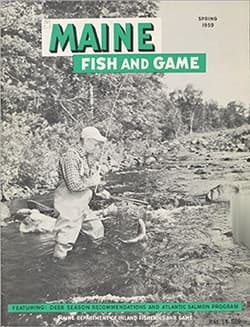 In 2015, MDIFW partnered with the Maine State Library to digitize the Department's historically rich archive. This is still a work in progress, but members of the public can now easily explore thousands of law books, documents, informational publications, photos, and (coming soon!) videos online at http://digitalmaine.com/ifw/. Contribute a Document – If you have an historically significant MDIFW-related item that you'd like to contribute, contact the Maine State Library at statedocs@maine.gov and they will assess its usability. Solve a Photo Mystery – Many of the historical photographs and slides in the archive are unlabeled or untitled. If you know who or what a photo is depicting, simply use the comment feature to let us know. Fill in a Gap – Among all the sets of historical documents, there are a few gaps. If you see one, and happen to have the missing piece, the library would love to borrow it, scan/digitize it, and return it to you fully intact.